During February we pay tribute to the history and legacy that the African-American community has brought and continues to bring to our culture. 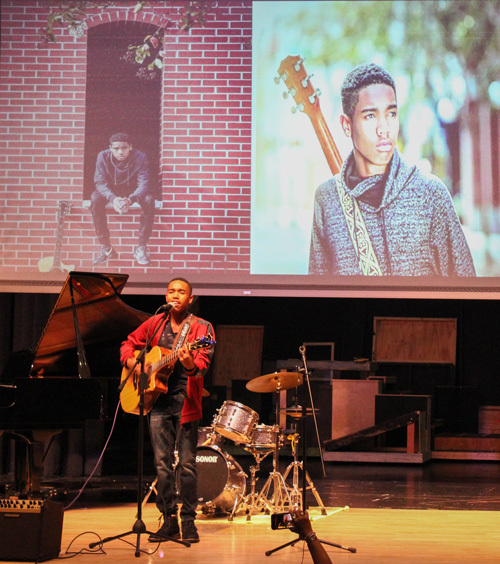 On Monday, February 11, 2019, Carrollwood Day School kicked-off Black History Month with a program that celebrated the richness of the music that black artists bring to our own community and to the world of music. Tampa music legend, Belinda Womack, shared the stage with other local jazz veterans, Kitty Daniels and Majid Shabazz, as well as rising star James Cole. They had the middle school and upper school students clapping, singing, and rising to their feet during the performance filled with gospel, jazz, and contemporary music. Ms. Womack shared an example of the gospel songs she first heard her own mother sing. Accompanied on the piano by the talented Maurice Allen (a former student of our own Mrs. Hollingsworth) she also introduced the audience to the sound of jazz – a musical form developed by African Americans. Although jazz was born in the U.S., she was quick to point out that it is an interpretation of people’s feelings that brings all people together. Octogenarian Kitty Daniels played piano and sang two more jazz songs, accompanied on the drums by Majid Shabazz. 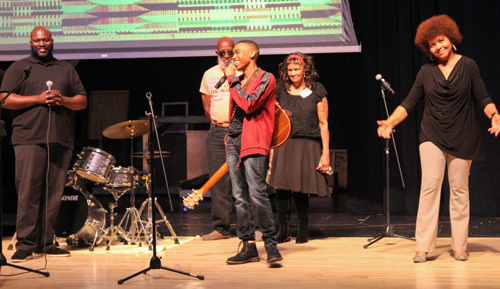 One of the songs they performed, Inshore, Offshore, is an original composition with music by Majid Shabazz and lyrics by Kitty Daniels. The final performer was James Cole, a current Blake High School student who has traveled the world performing his own music. JC also performed some of his original compositions including a new song that will be released on Valentine’s Day. Belinda Womack closed the program singing several different versions of Amazing Grace. She encouraged the audience to listen to old songs and make them their own, reminding them that music belongs to everyone.